UPDATED 3/1/2017: Our previous best microwave pick, the Panasonic NN-SE982S, has been discontinued by Panasonic. Instead, we’re recommending its sister model, the Panasonic NN-SD945S. The two models are identical in every way except that the time control on the SD945S is managed by a knob, rather than an electostatic dial. Since many users prefer the knob, this was an easy choice. We’ve updated the article to reflect this change, as well as provided many updates on other models and reviews. In most homes, the microwave only serves a few basic tasks: boiling water, popping popcorn and heating the occasional frozen dinner. And there's a good reason for this; microwaves offer little control over how heat is delivered. Try to get too fancy with the cooking and you'll likely end up with over-cooked edges and curdled sauces. But our pick for the best microwave, the Panasonic NN-SD945S, offers a unique "inverter" technology that offers precise control over power delivery and greatly increases the microwave's utility. When looking for the best countertop microwave, there were two basic considerations: we wanted plenty of room for large dishes and plenty of power. That meant narrowing the choices to those with a capacity over 2.0 cubic feet (usable capacity will be less) and at least 1200 Watts of power. That left more than a dozen models from GE, Kenmore, LG, Panasonic, Sharp and others. All of which had similar convenience features, such as sensor cooking/reheating and buttons for the most commonly cooked items, like popcorn. However, there was one other feature that needed to be on my must-have list— inverter technology. "What is inverter technology and why do you need it? ", you ask. Good question. The inverter feature transforms your microwave from an oversized reheating device into a functional cooking tool. 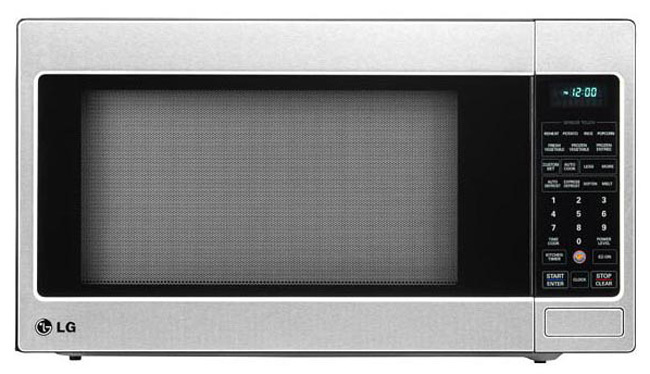 Typical microwaves use a magnetron—the element that cooks the food in most microwaves—that can only operate at full power. When you set it to cook at “50% power”, what the microwave oven is really doing is cycling the power on and off, delivering 100% power followed by periods of no power. Microwaves that use an inverter board are able to control the amount of power being delivered to the magnetron. So when you set it to 50%, it actually delivers a steady stream of 50% power. The result is more evenly cooked food and the ability to keep foods warm until mealtime. Plus, because you can set it to run at a very controlled, low power, you can use inverter microwaves to melt chocolate and butter, cook hollandaise sauce and perform other "real" cooking tasks that would normally be done on your stovetop. Panasonic, which owns the patent for the inverter technology, used to license it to other manufacturers, such as Amana, GE, and Whirlpool. It appears the licensing has stopped. With the exception of the GE JES2251SJ, only Panasonic currently has countertop inverter microwaves on the market. Panasonic has multiple 2.2 cubic foot inverter models, all nearly identical except for slightly different control pads and exterior design. I confirmed with Panasonic that the cooking technology behind their 2.2 cubic foot models is the same, so choosing which one to go with is more a matter of personal taste than performance. The NN-SD945S has a sleek, modern stainless steel body and minimalist keypad that would look great in any kitchen. We tested the inverter feature on a similar Panasonic model extensively back in 2009 and came away impressed. We used the microwave to make hollandaise sauce, melt chocolate and even pulled pork; all things that would be near-impossible in a standard microwave. We found more benefits from the inverter this time around. For instance, rice—one of my microwave recipe staples—overflows every time in my standard microwave because, even when set to "low", the short bursts of full power cause the water to boil too rapidly. The Panasonic NN-SD945S inverter is able to deliver true "low/med" power and rice cooks perfectly without a spill. We’ve attempted to do many of these cooking tasks in non-inverter microwaves and the results are unsatisfactory. The outside of the food gets too hot from the initial blast, causing burned chocolate and curdled eggs in my hollandaise. The NN-SD945S, like most large microwaves, also has a cooking sensor that measures the amount of steam being released to determine doneness of whatever you're cooking or reheating. No more guessing at cooking times or power levels. Just throw your food on the tray, hit sensor cook, tell the microwave what you're making (you can skip this step when reheating) and you're good to go. The microwave will modulate the power and time based on the sensor readings. In our testing, the sensor did an excellent job reheating leftovers, cooking frozen entrees and pretty much whatever else I threw at it. Our aforementioned rice came out perfectly, whether we were cooking one cup or two. The only time we found the sensor struggling was when we were reheating small quantities of food. We presume there wasn't enough steam generating to trigger the sensor to stop. The NN-SD945S's "Turbo Defrost" worked well...for a microwave. Meat still came out slightly dried on the outside. We find it much easier to defrost meat quickly using the warm water method—place meat in Ziploc bag, press out air and submerge in warm water. The water method works quickly without drying or cooking the outside. The warming mode (up to 30 minutes) came in handy for a side dish of polenta when our main course was delayed and we were running out of stovetop space. And because it is warming using steady power from the inverter, we didn’t end up with overheated edges. The controls on the SD945S were clearly labeled and easy to use. The sensor functions worked so well that we rarely needed to set a specific cook/reheat time. The dial offers more food cooking options – 18 in all including, Potatoes, Frozen Entrées, Oatmeal, White Rice, etc. – than a keypad would. While design may not be your primary focus with a microwave, the Panasonic is very attractive with its brushed stainless steel cladding. 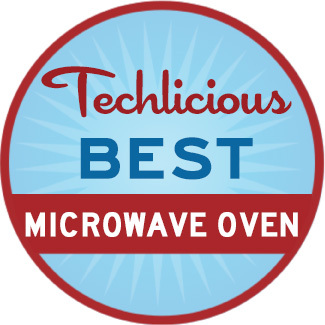 True microwave oven reviews (where people actually cook with them) are few and far between. And those few reviews out there tend to focus on the “typical” microwave cooking uses: popping popcorn, defrosting meat, heating leftovers. There’s nothing wrong with that – we pop popcorn in the microwave, too – but it ignores the added cooking features the inverter offers. We’re also reluctant to put too much weight into other reviews as we’ve found significant differences in opinion on the recommended models, which suggest to me that the results may have as much to do with the idiosyncrasies of the testing as the microwave, itself. That said, the Panasonic models have consistently placed near the top. The Sweethome recently tested smaller (1.6-cubic-foot vs 2.2-cubic-foot models) and ended up with the Panasonic NN-SE785S (which uses Panasonic’s new “cyclonic wave” technology) and the GE JES1656SRSS as their top picks. Ultimately, the GE won out for outperforming the Panasonic in its ability to cook a baked potato and popcorn. Unfortunately, the testing did not include any of the trickier cooking tasks we outlined above. The GE also gets very poor reviews from owners on Amazon – raking in only 3.1 out of 5 stars, with 43% of reviews only giving it 1 or 2 stars. CNET reviewed five models in 2013 from Amana, GE, Panasonic, Sharp and Whirlpool. They gave 4 out of 5 stars to the Panasonic NN-SD997 (a discontinued model very similar to ourrecommended NN-SD945). Interestingly, the Panasonic excelled in the baked potato test (unlike with Sweethome); suggesting that variability in testing methodology may have a lot to do with end results. Consumer Reports (subscription required) has a roundup with dozens of models. Unfortunately, not all the testing was done at the same time, leading to potential for testing methodology idiosyncrasies, and many of the models are discontinued. They didn’t specifically rate the NN-SD945S, however other large Panasonic models received either the top rating (74 out of 100 points) or one point off the top rating. Notably, Sweethome’s top pick, the GE JES1656SRSS, came in near the bottom of the pack (58 points). 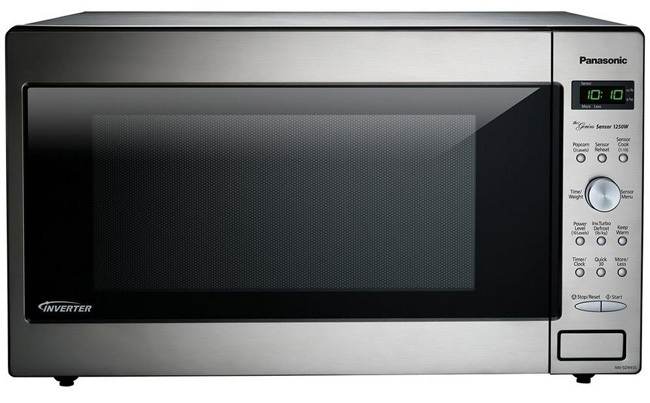 The only non-discontinued microwave in CR’s top rating category is the LG LCRT2010. It gets good reviews on Amazon with 4 out of 5 stars and an excellent 4.5 out of 5 stars on Best Buy. However (and there always seems to be a “however” with microwave reviews), Reviewed.com found the performance of the LG LCRT2010 to be sub-par, giving it only 5.9 out of 10 points for its “iffy results” in their evenness testing and defrosting results. Instead, they recommended the Panasonic NN-SN973S, granting it 9.4 out of 10 points for its “impressive ability to heat food quickly and evenly”. The NN-SN973 has been discontinued, but it is identical from a cooking perspective to our recommended Panasonic NN-SD495, and uses a keypad instead of dials for the controls. We always look at consumer experiences, where possible, when we review products. Actually living with a device for six months or more gives you a very different perspective than any lab testing. And for microwaves, this is especially important given the reliability issues with so many of the models. The Panasonic NN-SD945S received excellent reviews on Amazon with 4.5 out of 5 stars, with 90% giving it four or five stars. That’s impressive, especially for microwaves. Not that Panasonics haven’t been without their issues. Some models have had issues with the door latches. And the inverter board has been known to fail more frequently than the simpler magnetron on other brands. But in aggregate, the Panasonics have been higher reviewed than other models, including the top picks from the other reviews mentioned above. For those looking for a smaller oven, the Panasonic NN-SD745S offers the exact same features as the SD945S in a 1.6-cubic-foot capacity. Though at around $180 on Amazon, it's only about $10 cheaper than the larger model. The LG LCRT2010 gets top ratings from Consumer Reports and very strong reviews from consumers on both Amazon and Best Buy. It also offers TrueCookPlus, which standardizes the optimum cooking time for frozen foods – accounting for all of the variables that impact the cooking time of microwaveable foods, such as oven temperature, wattage, oven size, voltage, altitude and power settings. The problem is, many food brands don’t use TrueCookPlus codes, which greatly limits its usefulness, and Reviewed.com found that the microwave does a horrible job defrosting frozen food. Though for around $158 on Amazon, it’s a great budget choice. The Panasonic NN-SD975S uses Panasonic’s newer “cyclonic wave” technology, which is supposed to deliver more even distribution of the microwaves within the oven for more even cooking. In Sweethome’s testing of a cyclonic model, they didn’t see a benefit to this technology over the standard wave distribution in the GE oven. Given that the SD975S is $80 more than our recommended SD945S, and is otherwise identical in features, we believe the SD945S offers a far better value. The GE JES1656SRSS is Sweethome’s top pick, but got a mediocre review on Consumer Reports and terrible reviews on Amazon – we would avoid it. If all you want to do is make popcorn, boil water and reheat soup, almost any microwave will suit your needs. But the inverter technology found in the Panasonic NN-SD945S adds significant functionality to a device that is likely taking up a fair amount of space in your kitchen. We've used Panasonic inverter microwaves to braise meats, make sauces, melt butter and keep food warm using gentle heat—not tasks you would typically entrust to a microwave. For its combination of cooking excellence, simplicity of controls, design and excellent owner experience, the Panasonic NN-SD945S is our top pick. We've seen an unsettling number of complaints from consumers about microwave failures during the first couple years of use. These complaints go across brands. Apparently, they're not making them like they used to. Even if your microwave fails during the warranty period, you will be responsible for shipping it to the manufacturer for repairs (at your expense) or bringing it to an authorized service center (which are always further away than you would like). You still have the original recipt and box for shipping, right? Manufacturers usually warrant the magnatron for 5-10 years, but this only covers the cost for parts—you're still responsible for labor. The cost of shipping and repairing a microwave out of warranty can easily be more than the price of just buying a new microwave. If your product cannot be repaired, they will provide a cash settlement or gift card reflecting the replacement cost of a new item of equal features and functionality up to the Coverage Amount or provide a new or refurbished product of equal features and functionality. Let you bring your microwave into any Best Buy location to handle and manufacturer warranty or post-warranty repair. If your product cannot be repaired, they will either replace it with a product of like kind and quality and of comparable performance or reimburse you for replacement with a voucher or gift card equal to the product's current market value. Whether you would find it more convenient to bring your microwave into a Best Buy or ship it from your home is a matter of personal choice. Howvever, the Best Buy warranty is more expensive and you would only be reimbursed in cash for the product's current market value, not a new replacement item. Thanks for the information. My first, and to this point only microwave just died after 33 years. Actually, I suspect it is a minor issue, but who could fix it. I know a comparable model will not be found. It is a J C Penny, my mother had a Sears (Kenmore), they were identical except for the label. I have no idea who the manufacturer was. It was made when microwaves were real, a metal rack in the center, a probe to insert in meat and to then the other end plugs into a socket in the oven - this actually cooks meat properly, it really senses what is going on. The steam sensor is probably the best thing now available, but nothing can equal an actual probe in the meat. And it is 2.8 cubic feet capacity! I am going to go with one of the 2.2 cf Panasonic Inverter microwaves. That seems the best option, although the horror stories about Inverter failure, and the issues with the door makes me feel I will regret it, but; other manufacturers are likely no more reliable. I’m not a fan of cooking meat in the microwave because you get zero browning. But if you do use it for that, I think you’ll appreciate the inverter’s ability to cook at a true low power so your meat cooks to the correct temperature internal while minimizing overcooking the outer parts. I would suggest taking the internal temperature manually as it cooks, rather than relying on the steam sensor, especially for thicker cuts of meats. But it looks people are not satisfied with it. Good Review And do you know??? Excellent review on the current slate of microwave ovens. Couldn’t believe I came across it when my husband mentioned that the power changes on ours were really meaningless. I never paid attention and didn’t know we could get better. So on the lookout for the Panasonic. My question to you is while the 1.6 cubic size is close to what I have, is anything coming along just a bit slimmer? I’d love to get something closer to 20x16x12 and if I had a wish list 19x15x12 would be perfect. I know you are a busy guy but if you know of any upcoming news I’d appreciate a heads up. Our current Sharp is just about to give it up. Thank you! The Panasonic microwaves have been a pretty standard chassis size for years. The only changes have been to the control panel (along with associated programming functions) and the rollout of the “cyclonic” models in 2015. 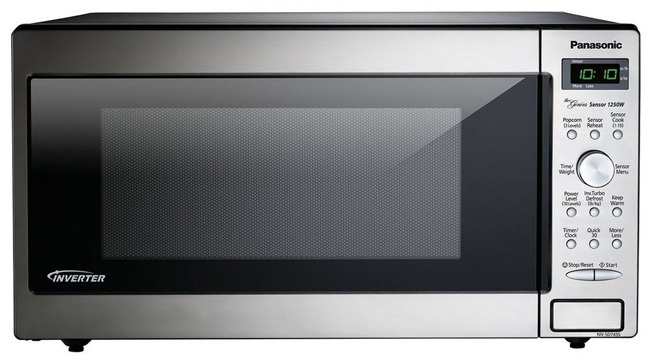 We have heard nothing from Panasonic in quite some time about new microwave models coming out, slimmer or not. Putting my analyst hat on, I doubt they will be coming out with anything slimmer for a few reasons. 1) Reducing depth would reduce capacity, making them less competitive spec-wise 2) Making slimmer models would require Panasonic retooling their factory, which seems like a big investment for a low-margin product. 3) Panasonic’s recent kitchen announcements/launches - the compact induction over and the larger FlashXpress toaster oven (shown at CES 2016 but never launched) - have been moving towards larger appliances, not smaller. So if you need a new microwave, don’t wait for slimmer model from Panasonic. Thank you very much for your response. I did find this Panasonic, 1.2 Cu. Ft. Built-In/Countertop Microwave Oven with Inverter Technology™ - Stainless Steel - NN-SD681S which seems to fall under the compact designation. Is this as good as the bigger ones except for the door issue? The comments about the door issue seem to be years old. Any idea if it is improved or if the WD-40 trick works well on it? If you give the thumbs up, I’m going to buy it. Thank you Josh. All the Panasonic microwaves have the same cooking technology, so it should cook the same way as the larger models. But the 1.2 cubic foot model will be much smaller inside, so some dishes won’t fit and you may find items heat less evenly as they get closer to the sidewalls. You may want to check out a 1.2 Cu Ft model in store (any manufacturer will do) to see if you are comfortable with the size. I, personally, think it’s too small, but you can judge for yourself based on what you plan to cook. As far as the door issue, it’s hard to say. Some models seem to exhibit it more than others. The problem occurs when the metal bracket inside the oven gets bent over time, causing the door latch not to catch. If it does occur, it’s fixable by taking off the cover and bending the bracket back into shape. WD-40 may help the latch slide in if the bracket is bent, but won’t unbend it, obviously. To cover both the door issue and the inverter board problem, I would strongly consider getting the extended warranty and just factoring that into the price. We shouldn’t have to go that route, but that’s the reality. And I really am a fan of the Panasonic’s cooking capabilities. I do all my cooking in a microwave, including brown rice and large batches of dried beans. You are right about the inverter technology being superior for the consistent low power in cooking things without spilling over, using stage cooking, of course. My Panasonic “Genius” inverter is over 15 years old, but the interior paint started peeling after 5 years. I read about people who have successfully repainted the interior, but I didn’t want to do that because if that peeled it would just get toxic paint in the food. Nor do I take manufacturers’ suggestion to throw it away and buy a new one at the first sign of peeling paint. That is wasteful. I use aluminum tape over the bare areas, after sanding. I have to replace the tape every six months or so, and be careful no edges ever come up to arc. Anyway, if Panasonic would combine the inverter technology with the dark ceramic interior Samsung uses in some microwaves, it would be perfect. I’m going to be purchasing a new microwave soon, and I’m just going to try to be careful about cleaning it gently after each use, which I realize is key to keeping the interior paint in good condition. Still, I wish they would use the more rugged ceramic coating so I wouldn’t have to be so careful about every drop that spills. Another design feature that would be nice would be a seamless interior, which LG has done. I realize it has to have an opening of some sort for the fan. What are you cleaning with? I’m curious whether something you’re cleaning with may be the cause of the peeling paint. It’s not an issue I’ve heard about before with the Panasonics. Are you using any cleaning products beyond water and maybe a little dish soap? I just use water and a paper towel to clean the inside of my microwave and rarely have to resort to anything more to get spilled/splattered food up. Great info on all of the microwaves Josh. Thanks. Pansonic’s repair process is similar to most other manufacturers. If you’re within the warranty period, you should be able to get repairs done at on your microwave at one of Panasonic’s authorized repair centers. They have many, but if one isn’t near you it’s a problem. Beyond the warranty, you’re eating the cost, and it’s often not economically viable to have them repaired. One of the most common issues with Panasonic microwaves is the door latch failing, but this is actually something that you can repair yourself, if you have a moderate degree of handiness. That said, an extended warranty for your microwave can give you better peace of mind that if the microwave fails in the first couple of years (when most failures happen) you’ll be covered. Generally, we’re against extended warranties, but with the high failure rates we’ve seen across microwave brands and the difficulty of shipping them in for repair, they’re worth considering. SquareTrade or Asurion? Which do you recommend? What I do is just add one or two 16 ounce cups of water to reduce the power level in the oven. Then you can work out the details for cooking whatever like eggs in a styro cup. Put the cups of water close to what you are cooking. That’s a helpful tip. It seems a little hit or miss relative to having a microwave with an inverter, which gives you precise power control, but it’s better than the full power blast you would otherwise get.